All warts originate as a virus colony settling on your skin from the outside. After about two years a colony tends to die and the wart either recedes gradually to nothing or degenerates into a shell that can be picked cleanly out of its socket, which then heals over. But until that decay begins the wart is contagious, which means that it can be spread by surface contact; so you may discover a younger seedling wart on any piece of nearby skin. Even so they are not usually very infectious; the few people who end up covered with them seem to be especially susceptible and need to boost their general immunity. Warts have a special liking for the skin of your hands and feet that is ridged with finger-prints, and can be easily distinguished from other kinds of lump because they disturb the print pattern locally. This is quite clear under a magnifying lens, and warns you that a wart you thought was cured has re-grown. A wart on you foot tends to be called a verruca, which is Latin for wart. A verruca arises in the same way as warts anywhere else on your body but then behaves a little differently because of the special properties of the skin on the soles of your feet and the palms of hard-worked hands, where they can get buried under great piles of corny skin which obscure their origin. You need to trim off the insensitive skin with a razor to see the tell-tale cauliflower pattern. Bear in mind if you do this that exposing the active wart makes spread more likely: very crusty warts are otherwise slow to spread. When they occur elsewhere on your body warts may take a different form. Crops of small flat crazy paving stones on your genital skin multiply fast and are very contagious, but also respond quickly to treatment. The kind that stand out on stalks from your eyelids and elsewhere are a nuisance and tend to recur after treatment, but do not seem to multiply. 1. Warts are less troublesome on tough, cool, well ventilated feet. The diet for health helps to proof your skin against them. 2. When you discover a wart keep it covered with adhesive tape — a dressing is unnecessary. That will prevent spread in dry conditions. 3. Cover warts on your feet with rubber socks in pools and showers; chemists usually supply them. Most swimming pool authorities now admit you if you cover your verruca properly: it is a pity to miss out on swimming for something so harmless. For a crop of large warts try Thuja 30, one dose four hourly for three doses. Wait a few days for an effect; no further dose is needed while the warts are waning, but you can repeat it if they do not. Many small warts anywhere, especially on your face and eyelids, may require Causticum 12 instead, taken three times daily. Men with genital warts should try Antimony Tartrate 12 or Sepia 6, three times daily. 5. Local treatment of warts on tender skin is tricky, and best done with medical help; but you could safely try using Thuja Ointment first. 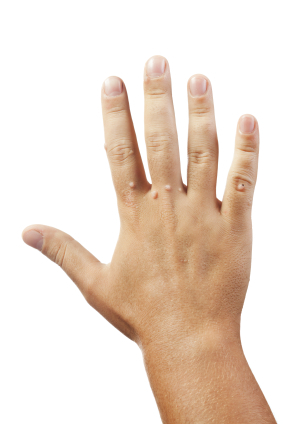 If you tackle large crusty warts on your hands and feet, nag away gently for weeks for the best result. Aggressive measures can arouse a wart as if you had only pruned it; a rosette of new seedlings then sprouts around the scar of the old. 6. A Caustic Pencil (Toughened Silver Nitrate) is very effective, but use it almost dry; the dampness of skin licked meanly or slightly clammy is quite enough. Rub the pencil tip on the damp wart for a minute and cover it when dry. The surface blackens, parches and separates cleanly in a few days. Treat it three times a week unless it gets sore or cracks. When you think it has all gone rest for a week and watch to see if the fingerprint heals undisturbed; resume treatment if tell-tale bubbles appear instead.